We warmly invite you to the last event of Café Chercher for 2017!!! 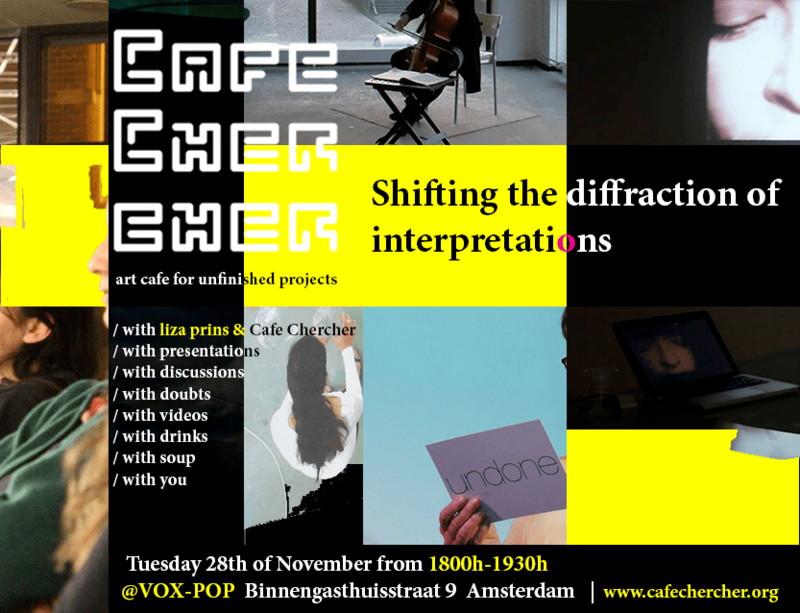 Join the 3rd event of the 4th season where Cafe Chercher will discuss its doubts and questions with the aim to re-invent and re-interpret the Cafe itself. Do you have some questions you would like to ask? Have an idea or two on what CC could change? Bring it on… and while you are at it bring your instrument, video, poem or your very experimental piece which is far from finished and totally not ready for the public to see and share it with us! Besides the very interesting presentations by lisa prins & CC the evening is open to public contributions. Let’s celebrate! The entrance at Café Chercher is still free and there is soup thanks to the Rietveld Research Group. We are happy to be hosted for a fourth season by VOX-POP UvA Creative Space.